…They ask this when they are standing in my shop amidst the furniture and home accessories that are displayed in The Whistling Elk. I usually just shrug off this question because I have never really thought much about it – until recently…you see I just sold my home. A short few words but a lot of meaning! Taking stock and packing I realized just how consistent I really am…there is a resemblance in that I really love to be surrounded by beauty. I guess if I am one thing…that is…Consistent !! 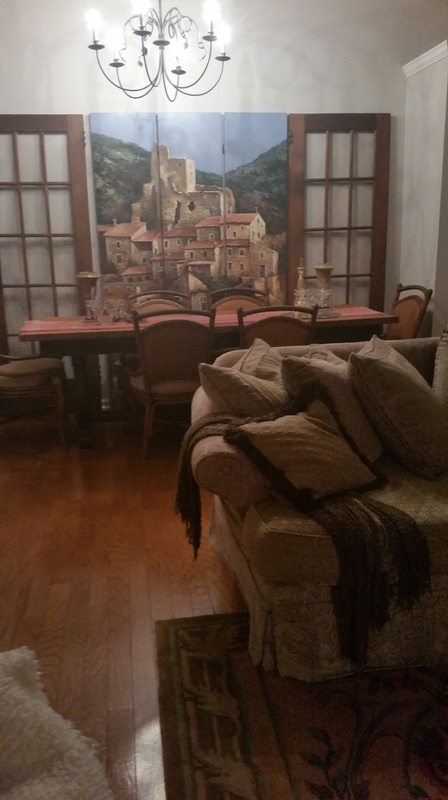 I have lived in my home for 28 years…it feels like a part of me. It always felt good just to be there. Over the years I have brought home pieces that I loved and integrated them into the mix. Some things came and went while others I cannot imagine parting with ever. My list of belongings reads like a list of the companies that I have done business with over the years in the shop. I have a J.M. Paquet sofa…they are out of business now being one of the ones to go early in 2008. but the sofa lives on and when the time comes I will have it reslipcovered yet again. Its so comfortable and I still love it so it will go with me to my new home. My Habersham buffet is another piece that I love. It makes me happy every time I just look at it. It houses my grandmothers dishes which will be going to my niece for safekeeping. The buffet though goes with me. The savonnerie carpet is from Feizy…and it was chosen because…well, I just fell in love with it. I love this room and have spent many, many hours here! 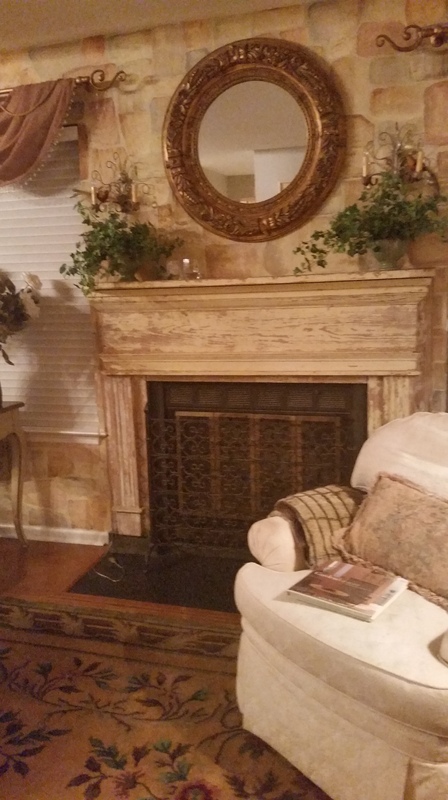 The mantel I bought when a 1890’s home in New Brunswick was demolished. It was a wreck all chipping and dirty. I took my hand sander and sanded all the dirt and loose paint off and then had it attached to the wall. 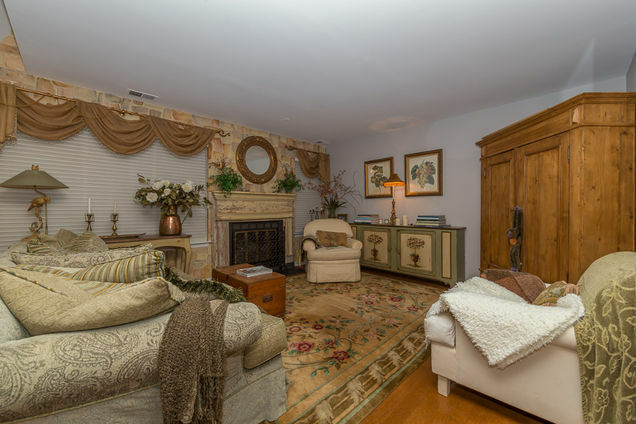 Since I have always wanted to live in an old fieldstone house I mimicked that with the faux painted fieldstone wall on which that mantel is mounted. I loved this look and am sorry to leave it behind. I guess I will have to paint a new wall! I purchased a really crummy pair of shutters and nailed them to the wall on either side of a large window and it created just the right look to go with the Dutch Caribbean bed. I cannot remember the name of the company that this bed came from but it is solid hand carved mahogany. The beautiful painted lingerie chest fit just perfectly in the corner of the room…it’s shape is what makes it special. It’s rounded across the front. It came from RH Home…they were a California company which is also gone. Sadly. 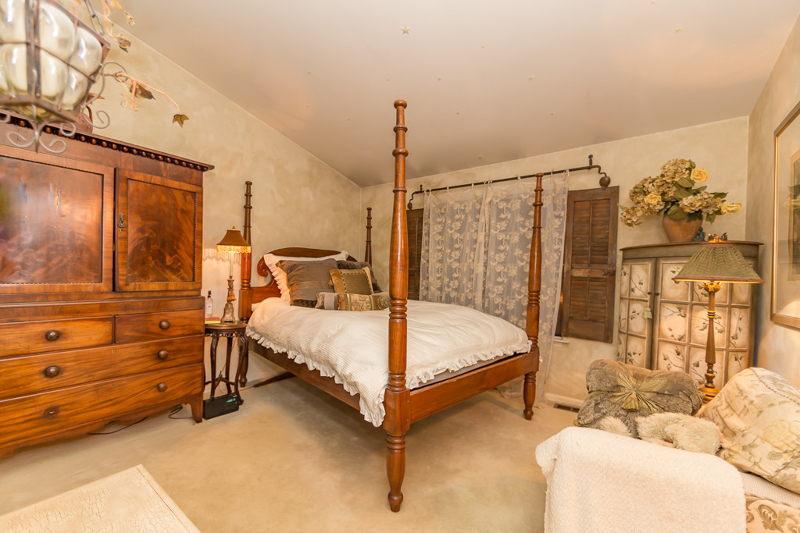 The walls I faux painted to resemble my take on old crumbling Italian walls…and you can’t see it in the picture but on the wall at the foot of the bed is a huge 5 foot x 4 foot picture of a hotel on Lake Como Italy which I have to say I loved waking up and seeing every morning. Perfect way to start the day! The Linen Press next to the bed is an antique piece from England circa 1880…my niece will be picking up this piece tonight and it will go to live in her bedroom. It came from a company called ARK Antiques which is also out of business…so many great companies over the years have come and gone. Sadly our economy is not good for small business these days. 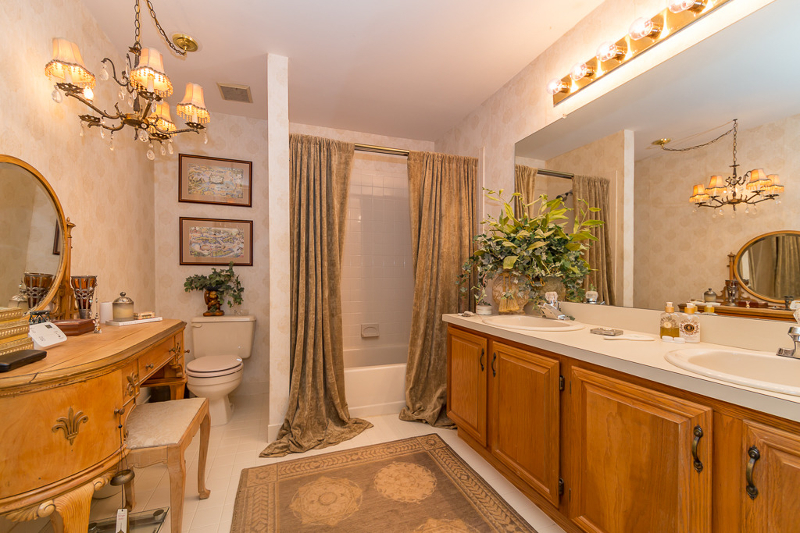 I really got fanciful with my master bath. The Alma Slade draperies are chenille and were perfect with the colors in the Nourison carpet. But my favorite piece is the Danish Vanity from ARK Antiques…circa 1910. So pretty! And of course I just had to have a little vintage chandelier in there…Right? Absolutely! So I guess this is my tribute to my pretty little home that I am leaving behind. I will miss it. A little place always filled with light from all the large windows. But I am also so excited to start over and to what I am going to create next! This entry was posted in DIY, Furniture, Home, Paint, Uncategorized and tagged architecture, color, decor, do it yourself, home, home decor, home furnishings, inspiration, interior design, photography, room design, The Whistling Elk. Bookmark the permalink. Thank you for sharing your beautiful home with your clients. Everything was exquisite. I know your new home will be just as lovely in its own way. Change always seems to take place in one form or another. A wise person learns to go with the flow and enjoys what comes next. and that certainly is you! Thank you Lyn for your sweet comments! I agree with you about change…i loved my home but am excited for the next one!! !